The Reading Fightin Phils (also called the Reading Fightins) are a minor league baseball team based in Reading, Pennsylvania, playing in the Eastern Division of the Eastern League. The team plays their home games at FirstEnergy Stadium. The Reading Fightin Phils were founded in 1967 as the Reading Phillies (commonly referred to as the R-Phils and sometimes Reading Phils) and they are the Double-A affiliate of the Philadelphia Phillies since 1967 and this affiliation is currently tied for the longest affiliation in Minor League Baseball. 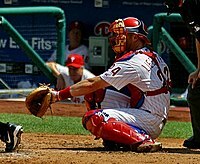 The team has been owned by the Phillies since 2008. The franchise has always been based in Reading and maintained its original name "Reading Phillies" from its establishment in 1967 through 2012. The Reading Fightin Phils are the oldest team in the Eastern League to play in their original and current city with the most seasons under their original name (Reading Phillies). The Fightin Phils' stadium, FirstEnergy Stadium which was built in 1951 and was previously known as Reading Municipal Memorial Stadium, has been home to the Reading Fightin Phils since their establishment in 1967. The stadium seats 9,000 fans, and on July 3, 2007, the stadium celebrated their ten-millionth fan to attend a game. The Fightin Phils won the Eastern League championship in 1968, 1973, and 1995, and were co-champions in 2001. The 1983 Phillies were recognized as one of the 100 greatest minor league teams of all time. Reading's first official baseball team, the Reading Athletic Club, formed in November 1858 and, for the next 15 years, played other local teams for unofficial championships and bragging rights. The Reading Actives date their existence to 1874. After the National Agreement of 1883, which organized major and minor leagues, the Actives became a member of the Interstate Association, one of the two original minor leagues. The Actives went 33–35 in 1883 against teams from Brooklyn, Harrisburg, Pennsylvania, Trenton, New Jersey, Wilmington, Delaware, Pottsville, Pennsylvania, and Camden, New Jersey (which disbanded that July), finishing in third place before the league folded after the season. In 1884 the Active Club became founding members of the Eastern League of Professional Base Ball Clubs. The Actives played sporadically for the next 12 years. The Reading Coal Heavers played in the Atlantic League from 1897 until the league disbanded in mid-June 1900. During this time, Lizzie Arlington became the first woman to play for a professional men's baseball team when she pitched the final inning of a game for the Coal Heavers. Baseball returned to Reading in 1907 when the York White Roses of the Class-B Tri-State League relocated and became the Reading Pretzels. In 1911, the Pretzels finished with the best record in the league, but lost a best-of-seven postseason series to the team from Trenton. On June 14 of that season, George "Jake" Northrop pitched the only perfect nine-inning game in Reading baseball history. The Tri-State League folded after the 1914 season, but the Pretzels were resurrected when the Albany Senators of the New York State League relocated to Reading in August 1916. That league folded at the end of 1917 due to the first World War. Beginning in 1919, Reading played in the Class-AAA International League with the Reading Coal Barons. Several future major leaguers played for the Reading team, owned by the Chicago Cubs from May 1927 until the end of 1930, including shortstop Bill Jurges and pitcher Lon Warneke. In August 1929, George Quellich set a professional baseball record that still stands today by collecting 15 hits in 15 consecutive at-bats. The Keystones franchise is now known as the Scranton/Wilkes-Barre Yankees. Reading became home to the Class-A affiliate of the Boston Red Sox in the New York–Penn League (now the Eastern League) in 1933. The Reading Red Sox had a successful two-year run before the team moved to Allentown (this franchise is now defunct). Five years later, Reading got another baseball franchise—this time, an unaffiliated team in the Class-B Interstate League called the Reading Chicks, which lost the league title series to the Lancaster Red Roses. In 1941, the Chicks affiliated with the Brooklyn Dodgers as the Reading Brooks, featuring future Dodger outfielder Carl Furillo. The franchise folded after the '41 season, and Reading was without a team for 10 years. The Cleveland Indians relocated the Charleston Indians back to Reading after the Reading Red Sox relocated to Pittsfield, the Charleston Indians was once again known as the Reading Indians for one more year before relocating again. Reading was without a baseball team in 1966 before a new Eastern League expansion franchise was established in Reading in 1967 which became known as the Reading Phillies. The Reading Phillies debuted at Municipal Stadium on April 22, 1967 against the York White Roses. The Fightin Phils' affiliation with the Big Phils has lasted unbroken since 1967. The Reading Fightin Phils' relationship with the Philadelphia Phillies was solidified even further when the Philadelphia Phillies purchased the then "Reading Phillies" in 2008. With the end of the 53-year relationship between the Baltimore Orioles and their rookie-league team in Bluefield, West Virginia after the 2010 season, the Reading/Philadelphia partnership became the longest current affiliation in Minor League Baseball (tied with the Lakeland/Detroit affiliation). On November 4, 2012, news broke that the Reading Phillies would be changing their name. On November 17, 2012, the team announced that its new name would be the Reading Fightin Phils. The team colors of the Reading Fightin Phils are Phillies red, nighttime navy, cream, and white. Their logo consists of a white and gray ostrich outlined in blue with flesh-colored beak and legs putting up his fists in a fighting stance, with the red block "READING" and blue script "Fightin Phils" wordmark right above it. There is also an alternate logo with said ostrich's upper body in a blue circle outlined in red, surrounded by a red burst and "READING" and "PENNSYLVANIA" tilted near the top and bottom, respectively. The Fightin Phils' home uniforms resemble those of their Philadelphia parent. The caps are navy blue, and feature either a red feathered "R", or the aforementioned ostrich logo without the wordmarks. The home jerseys are cream and have traditional red pinstripes, but are given a faux-flannel look to the design. In the center is the red "Fightin Phils" wordmark with the player's number in red right below it. On the left sleeve is the aforementioned circular alternate logo, with the parent Phillies' red "P" logo on the right sleeve. The Fightin Phils' road uniforms, on the other hand, carry an almost completely different visual identity. That identity's primary logo (officially an alternate for the team) consists of a hot dog named "Bunbino" inside a bun with muscular arms and wearing a blue baseball cap, a white jersey with pinstripes, yellow wristbands, and a mustard "B" on the chest. In his right arm, Bunbino squeezes a mustard bottle to form a mustard circle inside the surrounding sky blue circle. Inside the mustard circle but surrounding Bunbino, are the words "READING" and "PENNSYLVANIA" as in the ostrich alternate logo, but in a different yellow font, separated by a mustard stain. The caps are sky blue with Bunbino from the aforementioned logo. Like the home white jersey, the road gray jersey is given a faux-flannel effect; it carries blue piping on the chest and sleeves with a mustard script "Baseballtown" wordmark outlined in sky blue and black, with the player's number in sky blue right below it. On the left sleeve is the aforementioned Bunbino primary logo, with the Phillies' "P" on the right sleeve again. The Fightin Phils have two alternate uniforms, one home and one away. The home alternate cap is navy blue with a white feathered "F" with an ostrich fist serving as the middle stem. The home alternate jersey is navy blue with white undersleeves, carrying the white "Fightins" feathered script and the player's number in white below it; the ostrich is on the left sleeve and the Phillies "P" on the right. The alternate jersey for road and select home games is black with sky blue undersleeves, with the aforementioned "Baseballtown" wordmark on the chest, Bunbino on the left sleeve, and the Phillies "P" on the right. When this jersey is worn on the road, the Fightin Phils will wear a black cap with Bunbino; when at home they will wear a sky blue cap with the mustard "B". 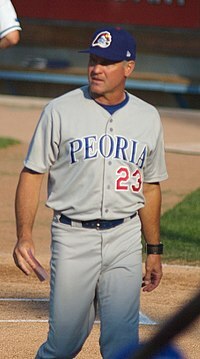 Scott Rolen, 3B, Philadelphia (1996–2002), St. Louis (2002–2007), Toronto (2008–09), Cincinnati (2009–present) played in 81 games for Reading in 1995–96. Gio González, P, Oakland (2008–11), Washington (2012–present), played in 27 games for Reading in 2005. Carlos Carrasco, P, Cleveland (2009–present), played in 34 games for Reading in 2007–08. Domonic Brown, OF, Philadelphia (2010), played in 102 games for Reading in 2009–10. Kyle Drabek, P, Toronto (2010–present), played in 15 games for Reading in 2009. Michael Schwimer, relief pitcher, Philadelphia (2011–present), played in 37 games for Reading in 2009–10. Rhys Hoskins, OF/1B, Philadelphia (2017–present), played in 135 games for Reading in 2016. ^ "A Change in the Name," Reading Times, vol. 52, no. 118 (Feb. 18, 1884), pg. 1. ^ "A New Base-Ball League," New York Times, vol. 33, whole no. 10,089 (Jan. 5, 1884), pg. 1. ^ Shattuck, Debra (2017). Bloomer Girls: Women Baseball Pioneers. University of Illinois Press. p. 151. ISBN 978-0-252-08186-6. ^ "Play Ball!". Reading Eagle. April 22, 1967. p. 4. ^ Audesirk, Christian. "Reading Phillies to Change Name After 46 Years". Maranatha Broadcasting Company. Archived from the original on 8 November 2012. Retrieved 6 November 2012. Baseballtown History Book – Reading Fightins. Wikimedia Commons has media related to Reading Fightin Phils.